My singing, songwriting has been such a fun adventure. Juliette and I wrote and composed an album in 2009, "Mockingbird Hill." Juliette and I had a great time working together. Juliette is a fabulous composer and I never would have dreamt to attempt it myself if it hadn't been for her inspiration. The true surprise through the process, however, was Juliette's voice. She has this amazing Nora Jones, Fergie sound. Mike Mcquire and Don Srygley's jaws fell open when she started to sing her song, "In My Backyard." She was only 11 years old. My goal was to bring the album to fruition and to show Juliette how artistic inspiration isn't enough; that one has to complete a project from beginning to end and that that is the hard part. After writing the notes on sheet music, recording our songs in Muscle Shoals, Alabama with Mike Mcquire, (Shenandoah), we then worked on copyrighting, registering with BMI, artistically creating our photo shoot and the album cover, and getting it onto iTunes! Our album was up on iTunes by Christmas of 2009. Mission accomplished. 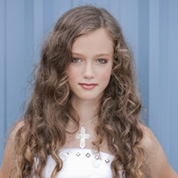 This year, 2010, Juliette and wrote and composed a fun song, "Little Rose." I decided to let Juliette sing this vocal, as she has the hipper voice. I sing harmony. It's a fun, country, dance tune. It, too, is available on iTunes now. My next goal? A Christmas album and a Cabaret act!